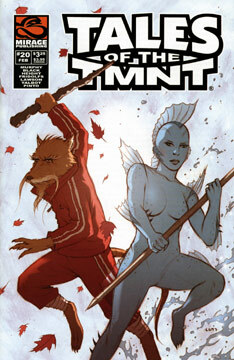 “The Trophy” – 12 page Master Splinter tale by by Steve Murphy, Ray-Anthony Height and Derek Fridolfs. Splinter deals with some hunters. “The Cure” – 10 page fish-woman story by Steve Murphy, Jim Lawson and Eric Talbot. The fish-woman takes a journey. “The Rippling” – 14 page TMNT story by Jake Black, Steve Murphy, Peter Laird, and Fernando Pinto. The Turtles investigate an underwater phenomena.